Have you ever considered your childhood fantasies and how easy it was back then to take one small concept and turn it into a HUGE scary deal? How often a noise in the dark, a scratch on your bedroom door by the dog , or a favorite book would send you into a tizzy for days?? 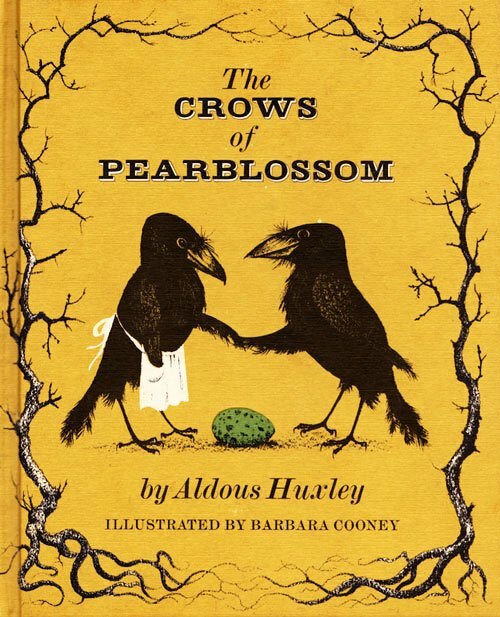 Written in 1944 by Aldous Huxley as a Christmas gift for his niece, The Crows of Pearblossom tells the story of Mr. and Mrs. Crow, who live in a cottonwood tree. The hungry Rattlesnake that lives at the bottom of the tree has a nasty habit of stealing Mrs. Crow's eggs before they can hatch, so Mr. Crow and his wise friend, Old Man Owl, devise a sneaky plan to trick him. This funny story of cleverness triumphing over greed, similar in tone and wit to the work of A. A. Milne, shows a new side of a great writer. Paired with stunning illustrations by Sophie Blackall, this timeless tale is sure to grab the attention of many readers--adults and children alike. When I was a kid, I was alone, often, left to make up fantasies and to believe in friends who would assist my mind in making light or "better" of the dark. I do not think this childhood workflow is 'special' to me in any way but I thank my childhood self today for all the lovely time and energy she spent focused on a beautiful fantasy world and hysterical make believe. Still today I am still super inspired by vintage children's books and this amazing book by ALDOUS HUXLEY is one of my all time favorites!! The story is just a little bit creepy ,and just a little bit sweet with the bomb illustrations. P.S down below I have added a free download to a new phone wallpaper! !